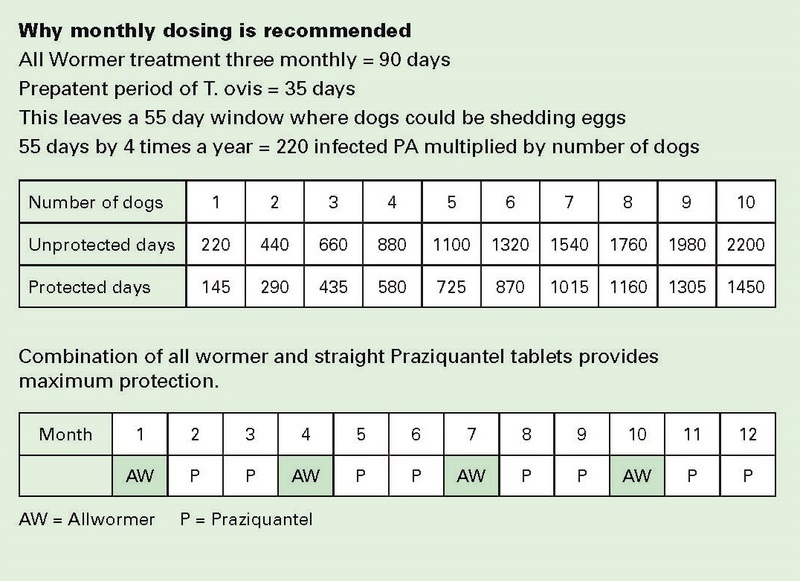 All dogs resident on farm should be treated on a regular basis with cestocidal drugs containing the ingredient Praziquantel which is a highly effective drug for killing tapeworms. Praziquantel drugs come in two forms; Straight Praziquantel tablets which target tapeworms and include Droncit and Wormicide tablets. There are also “all wormer” tablets such as Drontal Allwormer, Endogard and Popantel Allwormer. All wormers target roundworm, hookworms, whip worms plus tapeworms. For the best advice on tapeworm (cestocidal) treatments it is recommended that you consult your veterinarian or animal health adviser. The drugs, usually in tablet form, can be administered orally or given in dog food. For Sheep Measles control Praziquantel can be administered to dogs at the rate of 2.5 mg per kg of dog body weight. * Droncit tablets contain 50mgs of Praziquantel. This allows one tablet per 20kg of dog body weight. (some Droncit tablets come foil wrapped showing 1 Tablet = 10kg of dog body weight, for sheep measles control the weight can be doubled to 20kg). 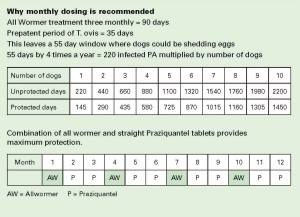 * Wormicide tablets contain 100mg of Praziquantel so can be used at one tablet per 40kg of dog body weight. Check package labelling to confirm the amount of Praziquantel in tablet. Under dosing should be avoided as it will not kill the tapeworms in the dog’s intestine. The Sheep Measles tapeworm matures in approximately 35 days, therefore dogs should be dosed every month to ensure no tapeworms, present in dogs reach maturity. Dogs should be on monthly treatments. Three monthly dosing while assisting control of Sheep Measles does not provide full cover as seen in the graph above showing the number of unprotected days per dog per year. Where dogs are not on a regular dosing regime but are accidentally exposed to untreated sheep meat they should be treated within a few days with a cestocidal drug. ALL new dogs should be dosed at least 48 hours before coming onto the property. Treatment kills any T.ovis worms present in approximately 10 hours but does not kill T.ovis eggs left in the intestine. If new dogs enter the property without being treated beforehand, they should be dosed, quarantined for 3-4 days and all faeces destroyed. On some properties rather than relying on each staff member to treat their dogs an option is for one person to be made responsible for treatment of all dogs on that property. IMPORTANT: In any on-farm dosing programme all pet dogs such as Jack Russells, Fox Terriers, Labradors etc should be included, often they have free run of the property and have access to household scraps. Pet dogs are commonly found to be the source of sheep measles tapeworms and these dogs must be part of the dosing programme.